Birmingham Small Arms was started in 1861. Its main products were machine guns, shotguns, and rifles. In 1880 B.S.A. also started to build bicycles. 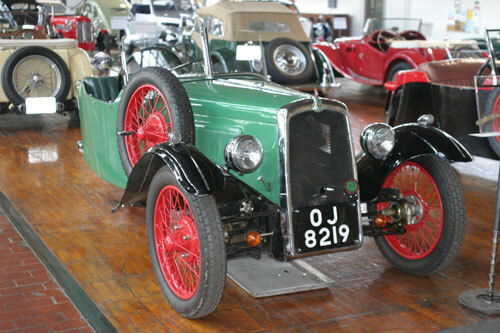 B.S.A.’s first cars were produced in 1907, and cars made from 1907 to 1915 were of the conventional 4-wheel type. B.S.A. also began producing motorcycles in 1910 and by the late 1920s was the largest motorcycle maker in Great Britain. The 3-wheeled B.S.A. cars are really an offshoot of the motorcycle business. In an attempt to make an affordable car, B.S.A. chose 3 wheels and a simple V-twin engine. 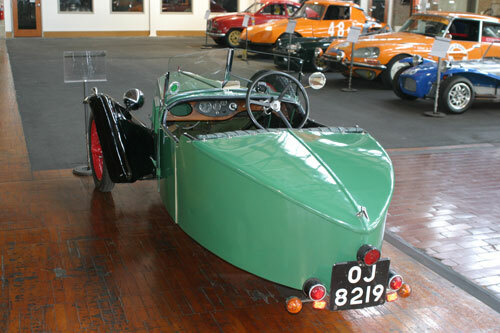 Morgan also made 3-wheeled cars, but they had much higher performance levels, as the motors were much more powerful and the chassis much lower for better road handling. B.S.A. ceased production of cars with the onset of WWII and never restarted production after the War. 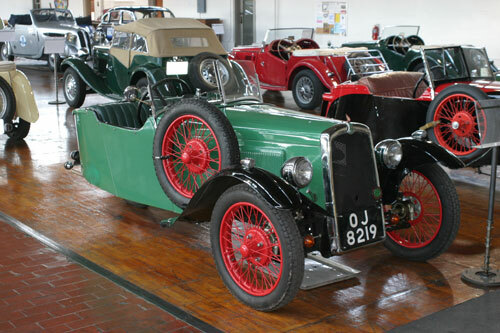 This car was generously donated to the Museum by John Armstrong. Manufacturer: Birmingham Small Arms Co.